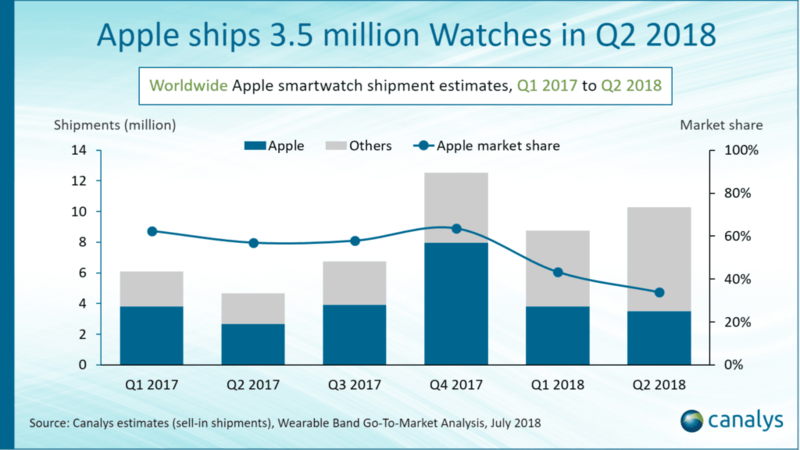 Apple had an excellent second quarter in the smartwatch market as it shipped 3.5 million Apple Watches during the quarter, 30% more than when compared to the same period last year. However, Apple’s market share in the Global Smartwatch Market is down to 34%, thanks to the equally stellar performance from brands such as Fitbit and Garmin. For the unaware, Apple’s market share in the smartwatch market at the end of Q1 2018 was 43%. Apple Watch shipments to Asia (excluding China) surpassed 250,000 units, with the LTE version accounting for about 60%. The cellular-connected Apple Watch Series 3 was the best-shipping smartwatch in Asia in Q2 2018. Earlier this year, Apple launched the LTE version of Apple Watch Series 3 in India, in partnership with Reliance Jio and Bharti Airtel. Shipment tracker Canalys revealed the report today. Overall, global smartwatch shipments reached 10 million units on the back of stellar performances by, among others, Fitbit and Garmin, as vendors capitalised on the wearables trend and diversified their portfolios to target distinct customer segments, said Canalys. On the whole, Apple is accounting for 35% of the total shipments. “Apple’s decision to expand internationally with operators has quickly reaped the rewards in the Asia Pacific,” said Canalys Senior Analyst Jason Low. Since the launch of the Apple Watch Series 3, Apple has formed partnerships with operators in Australia, Japan and Singapore, with Thailand, India and South Korea added in the last quarter. “Operators in these markets are willing to resell connected devices other than smartphones that can help them generate extra revenue from data services. India is a surprising addition to the list of countries. But this is a good strategy by Airtel and Reliance Jio to retain their high-value customers in a bid to minimise churn in a cut-throat market,” Jason Low further added. However, Apple will face a threat from other manufacturers going forward. Samsung is expected to launch its first Samsung Galaxy Watch at the Unpacked Event on August 9, while Google is also rumoured to unveil three Pixel branded smartwatches with Cellular connectivity at its October event, alongside the Pixel 3 and Pixel 3 XL.